It’s me. It’s always been me. I remember the first time we met. It was early 2000. I was young and just graduated from Mechanical Engineering. I didn’t have any job. I was desperate. That’s when I met you. It was like love at first sight. I spent sleepless nights just to know you. And more and more I spent time with you, more and more I love you. 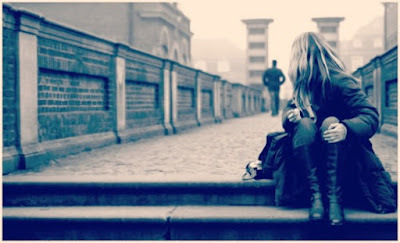 I spent time with several others, but my mind and heart were always be with you. I knew I have to get to you, at any cost. Even if I had to sacrifice. Even if I had to leave my home in Dubai. Even if I had to leave all my friends behind. Finally in 2006 we were officially together. I remember it was November, in Singapore. I couldn’t describe how happy I was. I traveled many countries in Asia Pacific for you. I never asked questions. I was a very happy man. And you invited me several times to visit your home in California. I was living my dream. You asked me to move back to Dubai with you in 2008. A request that I didn’t refuse nor question at once. You made me travel to many countries in Europe and Middle East. You made me witness the beauty of African countries. Once you even asked me to spend time in Central and South America. You gave me chances to show myself at your special events. You made me a better man. As the years went by, something changed. Something inside me wanted to be unleashed. I’m still in love with you, but I wanted to do more. I wanted to go out and meet others. I wanted to be more useful, wanted to make greater impact. I grew impatient and wanted new things to happen quicker. I wanted to use my spare time to talk to others, to try to inspire. Wanted to share my enthusiasm with others. And even though whenever I went out I always spoke about how wonderful you are, I could feel that you started noticing that something has changed. We’ve been together for quite some time. We’ve been through some high and low time together. Knowing how far we have reached together, I should be able to handle such thing like this. I was supposed to be able to convince you how much I love you. I was supposed to tell you I’m still the same person, nothing has changed. I was supposed to be a better man. However, this time I let myself to make a different decision. I wanted to break free from the relationship. I admitted I was scared at beginning. I was scared to make the change. But I believe it’s necessary. It always hurts to say goodbye. But this is the right thing to do. This is the best for both of us. Thank you for our time together the past 10 years. Thank you for giving me the special feeling the past 16 years. It’s time for me to move on. To chase my destiny. To build my own legacy. You were, and will continue to be, my special one. During one Software Defined Networking (SDN) workshop I hosted in Jakarta early this year, my friend was presenting a session with thought provoking title: Big Data vs. SDN. He is the CEO of a Deep Packet Inspection (DPI) and Data Analytic company that relies on Big Data technologies, so I can understand why he brought up such topic. 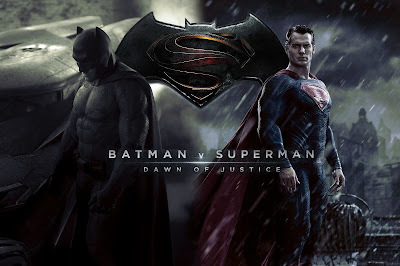 But just like the new movie Batman vs. Superman that will be released this week, should the two heroes are fighting each other? Should the two are competing between each other? Big Data and SDN obviously solve different problems. And the way I look at it, they are actually closer to work together to deliver platform to help business with CAPEX reduction, OPEX reduction and agility in delivering new services. The most natural approach to define Big Data is with the bigness. However according to Gartner, Big Data is defined as “high volume, high velocity and/or high variety information assets” that can be used to improve decision making and provide better insights.The majority of raw data, particularly Big Data, does not offer a lot of value in its unprocessed state. Big Data Analytic is the process of examining Big Data to uncover hidden patterns, unknown correlations and other useful information that can be used to make better decisions. SDN paradigm to separate control plane and data plane has objective to create network abstraction for faster innovation. We can create new network applications without any need to interact directly with the actual network devices, instead our applications just need to consume the APIs provided by SDN controllers. SDN can be coupled with NFV, Network Function Virtualization, to run network functions and software on any open standard-based hardware to reduce CAPEX, OPEX, power and space. 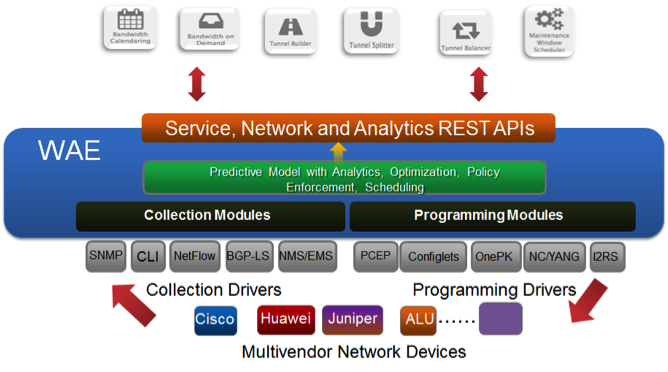 The orchestration of the network based on SDN and NFV can automate, provision, and interconnect all physical and virtual network resources. Last year Gartner showed in their Hype Cycle that SDN & NFV is moving from hype to reality. The hype reached the peak on mid 2013 when most people thought that central controller using OpenFlow would control basic network devices completely, all network functions would transition to run on x86 platforms, and this paradigm would apply across to all aspects of networking. However, by mid 2015 most people understood that SDN & NFV implementation will use hybrid control plane consisting of a mix of distributed and centralized control plane, the network will consist of a mix of physical and virtual network functions, and SDN solutions are based on specific requirements / features and use-cases driven approach. How can SDN & NFV be connected to Big Data & Analytic? SDN applications must be responsive to the world in which they exist. If we are going to use SDN technologies to auto-provision network services, and turn the network to be truly dynamic, we will need to have feedback loops to ensure the desired behavior is actually occurring after a change is made. The natural progression from manual to automated will pass first through network analytics. As Michael Bushong wrote for Infoworld: "Ultimately, the promise of SDN will be inherently tied to the information that surrounds the network and drives the decisions that make SDN applications interesting. With more and more endpoints driving increasing traffic to a growing number of users, that adds up to big data." Two weeks ago I was in Brussels to try Cisco WAN Automation Engine (WAE), a sample implementation of network analytic for Wide Area Network. To many network operators and service providers, WAN are oceans of uncertainty. Resource-constrained and multivendor, WANs produce delays and outages in far-flung and sometimes remote areas, posing a special set of issues that are distinct from those we see in data centers and access networks. WAN bandwidth is the most expensive bandwidth in the network and failure impacts are large. WAE allows service providers to respond to overall traffic growth in terms of keeping the whole network stable and not just provisioning to traffic peaks. WAE offers what-if scenarios and failure analysis, empower the customer to be able to examine the impact of network failures in more detail, and was able to adopt a new policy by only upgrading links that were in danger of dropping packets on single-circuit failures. Using predictive analytics capabilities of WAE, we can build a powerful SDN solution that allows us to deploy and optimize innovative new services, such as global load balancing, bandwidth calendaring, bandwidth on demand, and premium network routing. 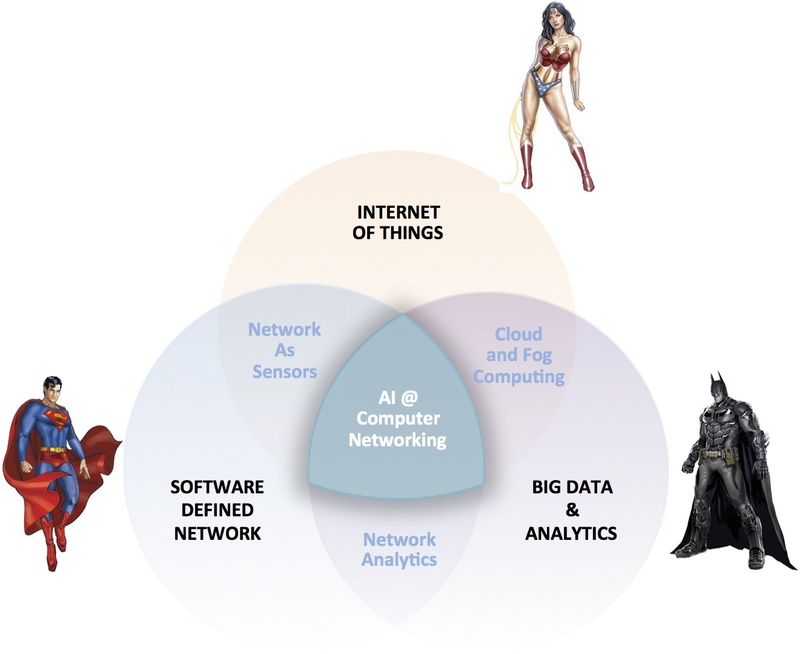 So we have seen how Big Data (Batman) and SDN (Superman) can work together, who should be the Wonder Woman in this story? It is obvious, isn't it? Internet of Things. IoT and Big Data relationship forms Fog Computing, that uses one or a collaborative multitude of end-user clients or near-user edge devices to carry out a substantial amount of storage, communication and control, configuration, measurement and management. Fog computing can be perceived both in large cloud systems and big data structures, making reference to the growing difficulties in accessing information objectively. With IoT it means everything is now connected. With huge explosion of number of endpoints, IoT will require a network that is not only self-provisioned, but as well as adaptive, dynamic and responsive that can be achieved with SDN. The network must provide broad and deep visibility into network traffic flow patterns too, the network must become the sensors, and this information can be used in different implementation such as for network security where by leveraging rich threat intelligence information allows for more rapid identification of security threats. 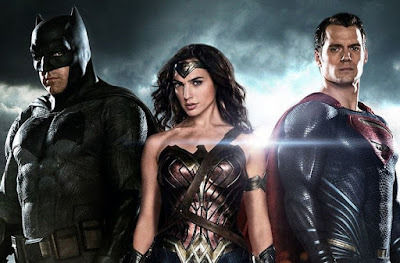 When the three superheroes are together, what should we call them? Introducing AI @ Computer Networking. JP Vasseur, a Cisco Fellow, during Cisco Live Milan last year presented this as Self Learning Networks. Ex-Cisco CEO John Chambers mentioned this terminology in his keynote for Cisco Live 2014. Packet Pushers call this Machine Learning for Networks. Artificial Intelligence, a singular consciousness that spawned an entire race of machines, as Morpheus explained to Neo in The Matrix back in 1999, is coming to unexpected places like computer networking. David Meyer, CTO & Chief Scientist at Brocade and formerly at Cisco, wrote the following notes: "it doesn’t take a lot of imagination to see how sophisticated unsupervised machine learning will revolutionize many of the more complex network tasks that are solved today in (much) less dynamic ways. For example, problems such as data center orchestration could benefit greatly from this technology. Clearly functionality that we’re talking about in networking these days, including Network Function Virtualization, Service Function Chaining, Mobility and the like are great candidates for treatment by Deep Learning. More generally, orchestration and optimization of Compute, Storage, Networking, Security and Energy (CSNSE) are prime candidates for consideration by Deep Learning technology. And consider what DevOps-style automation might look like when combined with Deep Learning." Even IBM believes Watson, not SDN, is the future of networking. IBM's cognitive system demonstrates the power of artificial intelligence which will run our networks and transform IT management. They even come up with another cool name: AI-defined networks. And it won’t be about automating routine tasks, programmatically managing networks or providing a platform where humans create evermore clever access policies. Instead, we will teach machines that watch our network traffic, monitor our applications and cognitively recognize novel behavior on our firewalls. So SDN is not the future of networking. And I agree. It is simply part of network evolution that is happening right now. If your network has not embraced SDN & NFV technologies, it is not a question of If but When. SDN will happen eventually. The future of networking lies on the combination between SDN & NFV with Big Data & Analytics, and IoT. 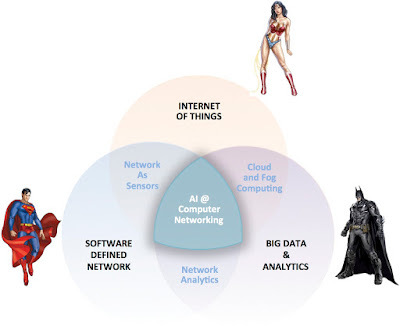 The three superheroes are working together and we may call them Self Learning Network, or Self Managing Network, or AI @ Computer Networking, or AI-defined Network. Now let's just enjoy Batman vs. Superman movie. 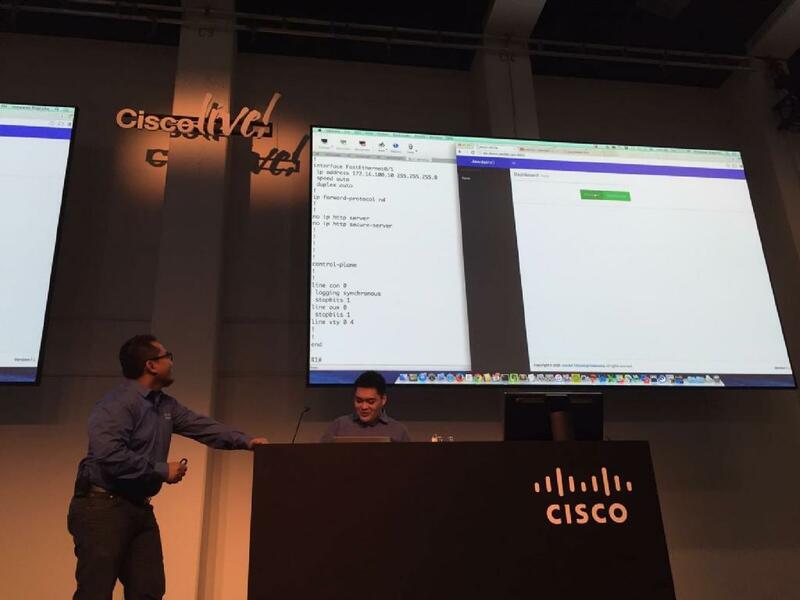 What a Week at Cisco Live Berlin! I’ve been very busy the past 6 months. I was juggling between my work at Cisco, my personal activities in Indonesia, SDN warriors group, my MBA final semester, traveling, my SDN & NFV skill transformation, family issues, and all other tasks. I don’t believe in multi-tasking, so what I did was actually task-switching. Make priority list of all the tasks, keep switching from one task to another, re-prioritize the list, continue switching and so on. And unfortunately updating this blog was never the top priority in the list. Anyway, during August 2015 I was leading my team to host SDN Hackathon event in Jakarta, Indonesia. It was 3-day event, started with 8-hour SDN Workshop to explain the technology from the architecture, SDN & NFV use cases in real world, up to the discussion about the skills we must develop to become Network Programmability Engineer and Network DevOps. 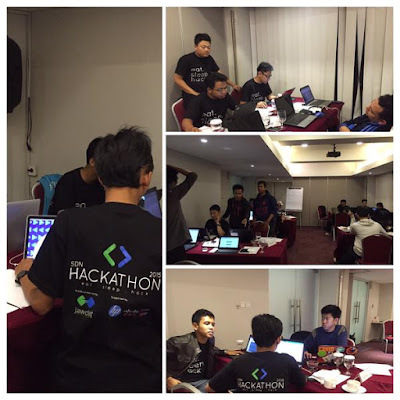 The Hackathon happened after the workshop where we challenge group of students for 30 hours straight to develop SDN solution ground-up, from setting up physical network infrastructure, virtual infrastructure, all the way to workflow automation to provision network services using Web User Interface. I won’t talk in detail about the event. It’s been a while so I don’t even remember many things that happened anymore. 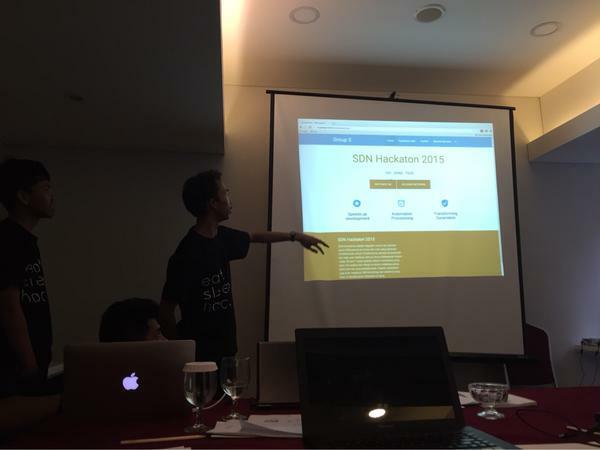 But I know for sure that it was the first SDN Hackathon ever in Indonesia. 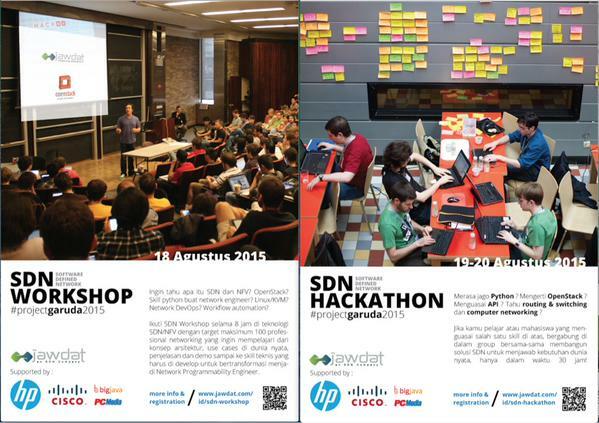 And I think it was the first SDN Hackathon in the world that asks to build SDN solution to perform end-to-end network services provisioning. So one magic button on the web interface can start the VM in OpenStack compute, configure the VM until it can provide Internet service, monitor the VM lifecycle, at the same time auto configure all the physical and virtual network, and deploy the network policy such as Access Control List and QoS. Fully automated and no human interaction during the process. It was an interesting experience and to my surprise the students were doing well, even they didn’t know much about SDN before the event, and half of the group was able to finish the challenge. I did several presentations to explain about SDN solution during the workshop, then I watched the students closely during the 30 hours Hackathon. Most of them didn’t sleep. We provided all the food and drink for free, but no one seems to enjoy it. Everyone was busy. Busy discussing the technical solution. Busy coding. Busy modifying config files in Linux. Everyone was so focus to answer the list of challenges within the time limit. Instead of taking CV and call the candidate one by one, by hosting one Hackathon event I would be able to get several good candidates at once. I would be able to see how they work under pressure, how they handle non-familiar task, how they work with people from different background, the way they communicate, to see if they are team player and even to judge their leadership skill. If I was to hire someone to become SDN & NFV Consultant or Architect, beyond the skill and personality I would look at her experience, her reputation in the market, her network and contacts, and what others say about her. But if I want to hire fresh graduates or even someone with less experience, who most likely has not built reputation or network, so my focus is mainly on the skill, ability to deliver outcome and a team player, I believe this is the best way. I don’t need to create multiple hiring process, come up with long list of interview questions, and I don’t need to build simulated environment to analyze candidate’s ability. Next time I was going to hire someone, I would rather host a Hackathon event.